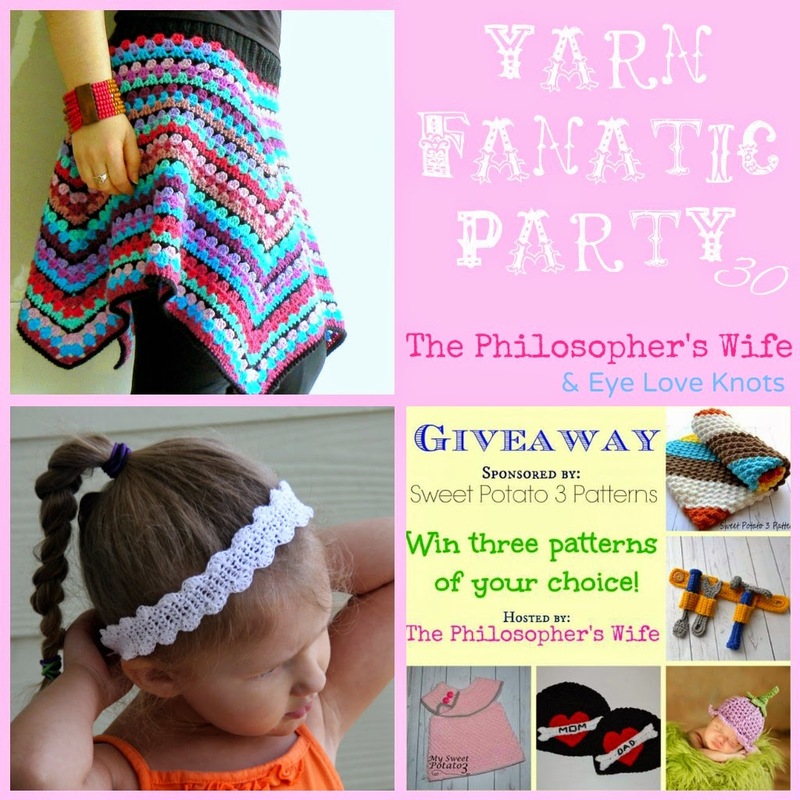 Welcome to the Yarn Fanatic Party! A place to share your projects, see what others have made, support one another, and even enter a yarn related giveaway. My own crochet and knitting projects will be taking a back seat to some sewing this week. I had the brilliant (or perhaps insane?) idea that sewing matching mother and daughter Easter dresses would be fun this year. At this point Catherine's dress is mostly finished. I haven't even started mine yet! Did you see this Granny Square Skirt? It's so fun! I love that beaded cuff that she's wearing. 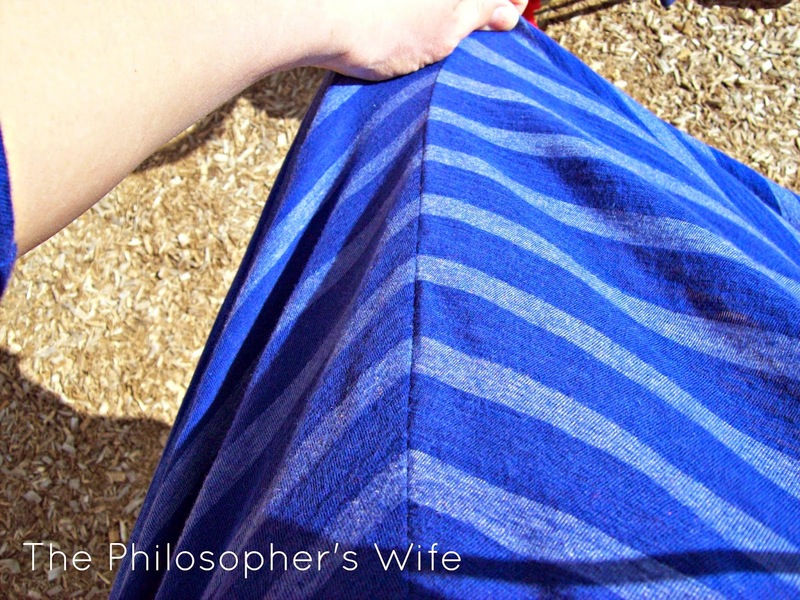 There was also a toddler skirt linked up last week. I love how versatile crocheting is! Make sure that you check out my Facebook page, I will be sharing more of the fabulous yarn-y projects from the Yarn Fanatic Party over there! Have you seen my Easy Scalloped Headband? It's an oldie, but a goodie. Also be sure to check out Alexandra's cute ribbed diaper covers. 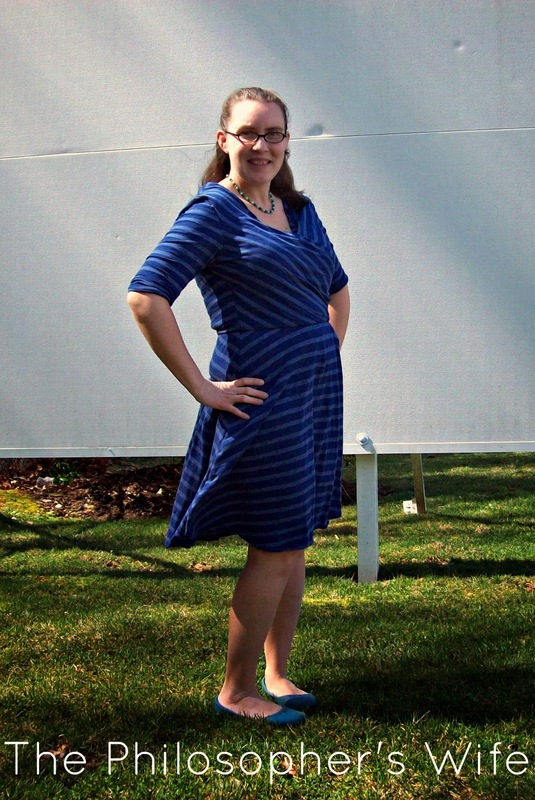 I'm very excited that Christine from Sweet Potato 3 Patterns is today's sponsor. She has some really cute patterns. I particularly love the Tulip Flower Hat, the Heart Tattoo Hat, the Tool Belt, the Classic Sweater Dress, and the Diagonal Delights Baby Blanket. You can find her patterns on Ravelry, on Etsy, or on Craftsy. three patterns of their choice! Details and Important Information: Must be 18+ to enter. US only. Void where prohibited. Winner must respond to my email within 48 hours or a new winner will be chosen. Social media is not affiliated with this giveaway. The sponsor is responsible for prize fulfillment. You don't pay anything extra, but if you purchase something using one of my links I get a few pennies. I greatly appreciate your support! 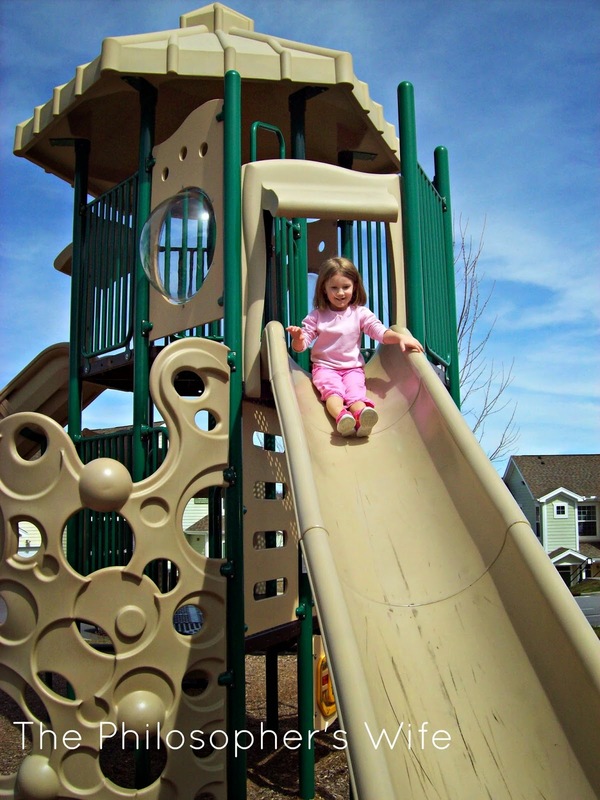 Spring is here and if your little ones are ready to get outside and play, we've got just the thing for you! Step2 has just released their NEW Igloo Wagon with Cooler and they've combined two great things into one - a wagon AND an Igloo cooler! 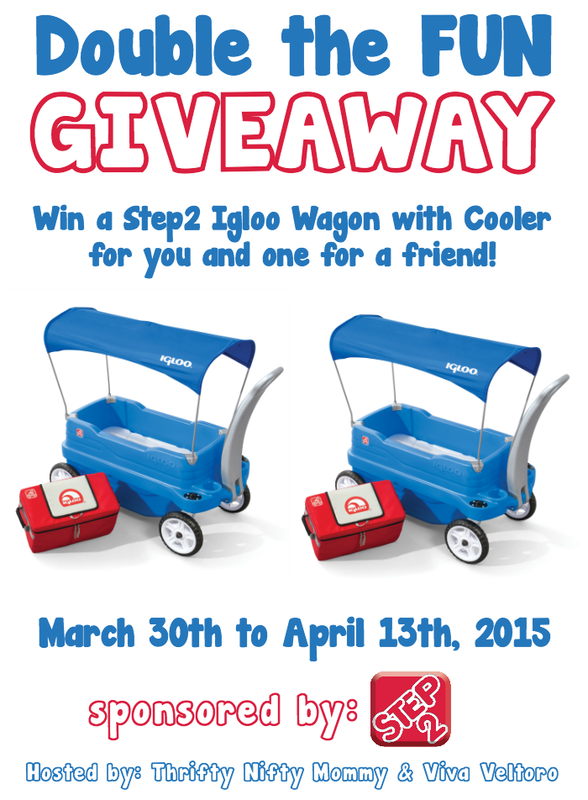 Here's some information about this COOL new product from Step2: The Igloo® Wagon with Cooler by Step2 is the perfect ride-on for long days trips for the little ones. It’s a 2-in-1 wagon and cooler that will keep your kiddos comfortable and your food nice and cool. This durable blue wagon provides youngsters with an enjoyable ride around the neighborhood, campground, zoo or amusement park. Your family can have a picnic in the park with all the snacks and refreshments the Igloo® Wagon with Cooler can hold! Made in USA of US and imported parts from China. Ruth from Viva Veltoro created an ultimate toddler tailgate experience with her Step2 Igloo Wagon with Cooler and Janessa from Thrifty Nifty Mommy recently took hers to the park for a picnic where her kids had fun enjoying the classic Dirt dessert - be sure to check out her recipe! Since this innovative new wagon takes two great products and DOUBLES the fun, we're giving one lucky reader the chance to win TWO Step2 Igloo Wagons with Coolers - one for themselves and one for a friend! Disclosure: This giveaway is sponsored by the Step2 Company. All images are courtesy of Step2. 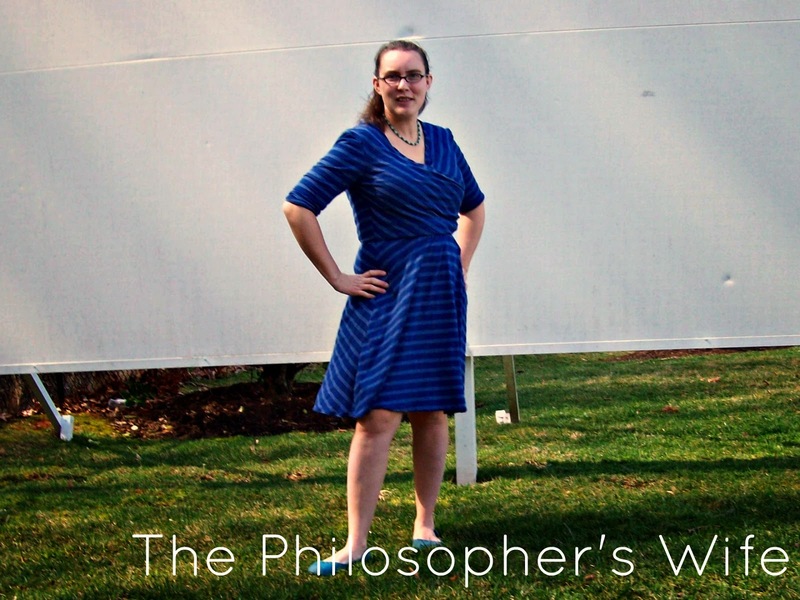 Viva Veltoro, Thrifty Nifty Mommy, and the participating blogs, including The Philosopher's Wife, are not responsible for prize fulfillment. One winner will be randomly selected using the Giveaway Tools random selector and notified via email. Once notified, the winner will have 48 hours to respond or a new winner will be chosen. This giveaway is in no way associated with Facebook, Twitter, Instagram, Pinterest or Google. Void where prohibited. How do you proclaim your craftiness to the world? (Besides being able to say, "Oh, I made it" when people ask you where you got that cute scarf, or skirt, or dress, or earrings, or whatever it is.) Buttons & Things has you covered. This Etsy shop, run by Pepper, has some of the cutest craft themed pins and magnets that I've seen. (She also has some great stitch markers.) I was so happy that she sent me the "Even More Knitting Buttons" and a few other pins. As soon as I took them out of the packaging I loved them. They are too awesome, how could I not? The magnets are nice and strong. Which is perfect for my family, because my daughter also has the creative gene and the refrigerator is often covered in artwork! I tried taking pictures of the magnets on my fridge in various forms of light, and at various times of day, but I simply couldn't get the magic formula quite right. Despite the poor photo quality I think that you can see why this pirate magnet is one of my favorites. It makes me giggle a little to myself each time I look at it! The below four are pins. I've loved this style of button pins since I first came across the American Girl Grin Pins. (Anyone else remember those? I'm dating myself here. If you don't know what I'm talking about just search for them on Ebay. I even found some on Amazon.) Once Dominic is a little bit older, right now he needs pretty constant attention, I am going to make a project bag for while I'm out. (I'm thinking something like the red purse I made with this pattern.) I will proudly display these pins on the bag. I can't wait! These buttons would make a great gift for the crafter that you know. Be sure to connect with Buttons & Things so that you can keep updated about shop news! Go say "Hi!" on Facebook. I'm also very excited to tell you that Pepper has given my readers their very own coupon code! Make an order before April 9th and use the code PHILWIFE15 to take a $1 off! So, tell me, which button is your favorite? This was a sponsored post. I received some magnets and pins in exchange for my honest opinion. 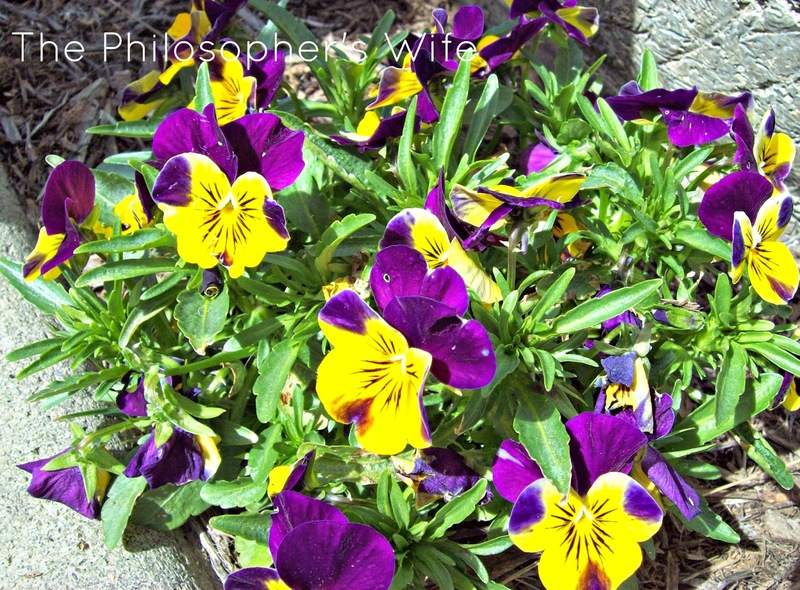 Share your own family friendly Wordless Wednesday post. If you want a truly "wordless" post then stop, don't keep reading! Otherwise, there's more . . . 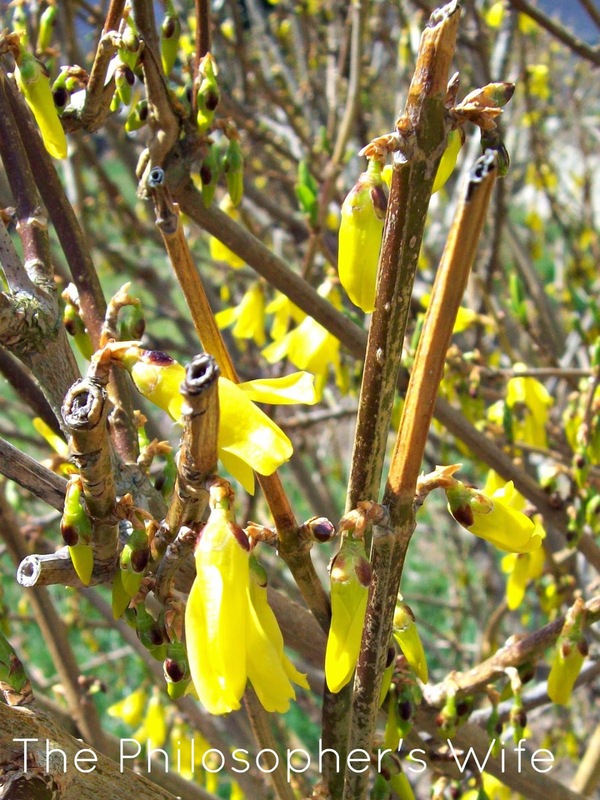 I am so happy that it's Spring! I love all of the seasons, but I am ready for pretty flowers and spending the afternoon at the park. Last week I shared some pictures from a walk the kids and I took. 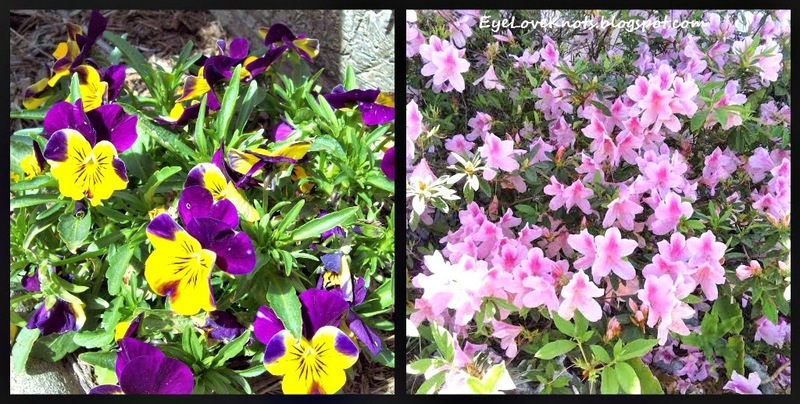 Alexandra, my Yarn Fanatic Party co-host, also shared some beautiful azaleas of her own. Every week I enjoy seeing what others have been busy creating. I am in love with this African Flower Blanket. Isn't is pretty? These colorful Kaleidoscope Mandalas are so beautiful! Also, the free pattern doesn't look too intimidating! In keeping with today's Spring Flower theme, I am going to give one lucky reader this Vintage Flower Collection ebook. 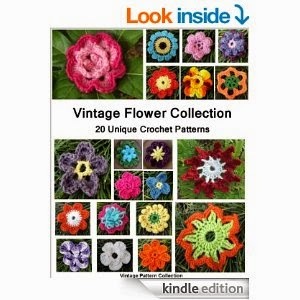 I do not personally own this book, but I love all the crocheted flowers on the cover! Details and Important Information: Must be 18+ to enter. US only. Void where prohibited. Winner must respond to my email within 48 hours or a new winner will be chosen. Social media is not affiliated with this giveaway. 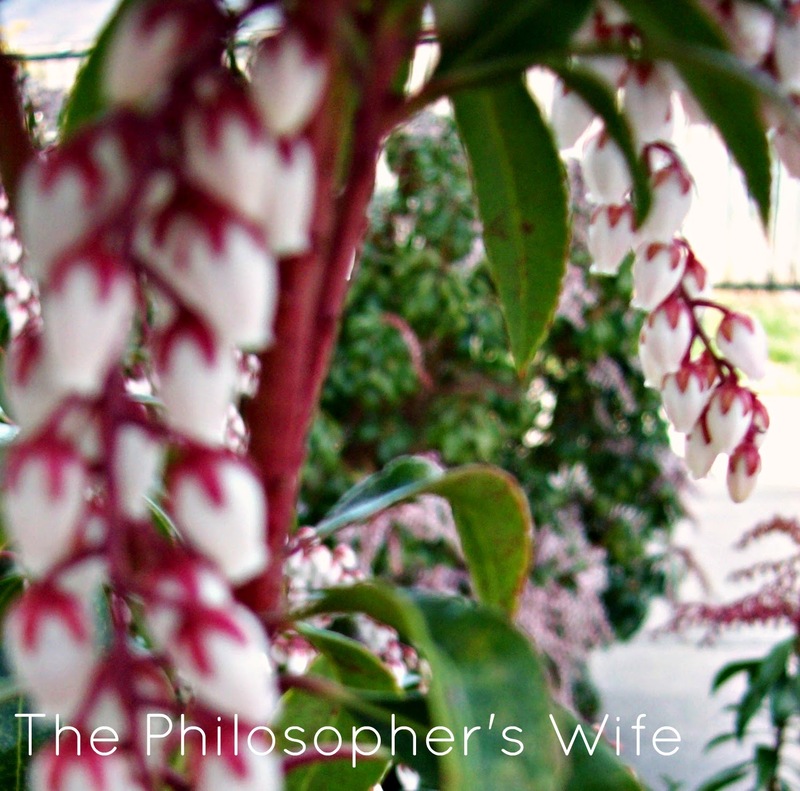 The Philosopher's Wife is responsible for prize fulfillment. 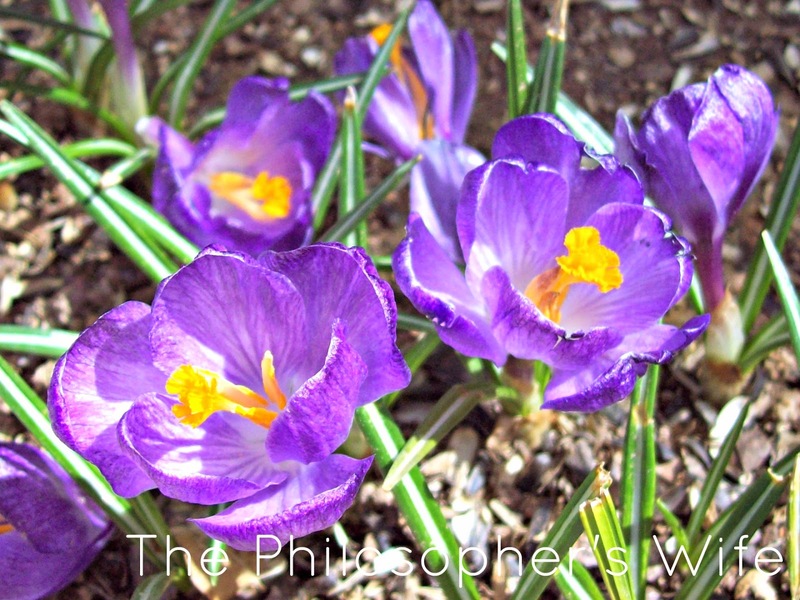 Wordless Wednesday: Spring is in the Air! 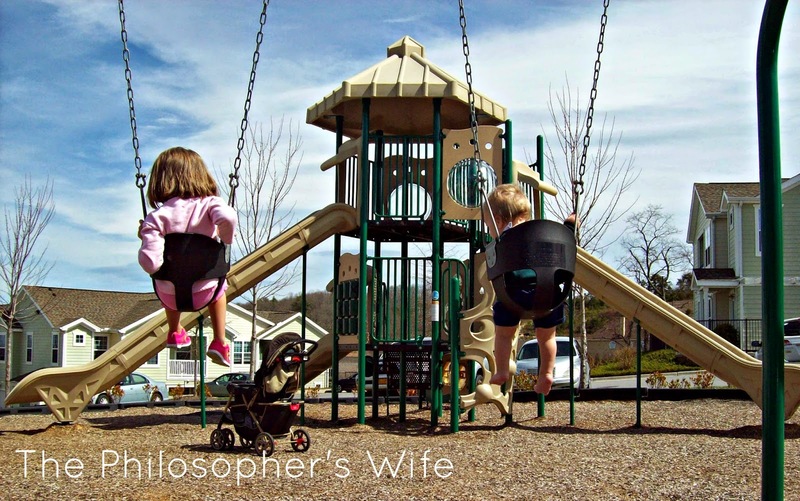 Share your own (family friendly) Wordless Wednesday! Last week was Selfish Sewing Week. I was hoping to sew last week and blog about it . . . but that didn't happen. 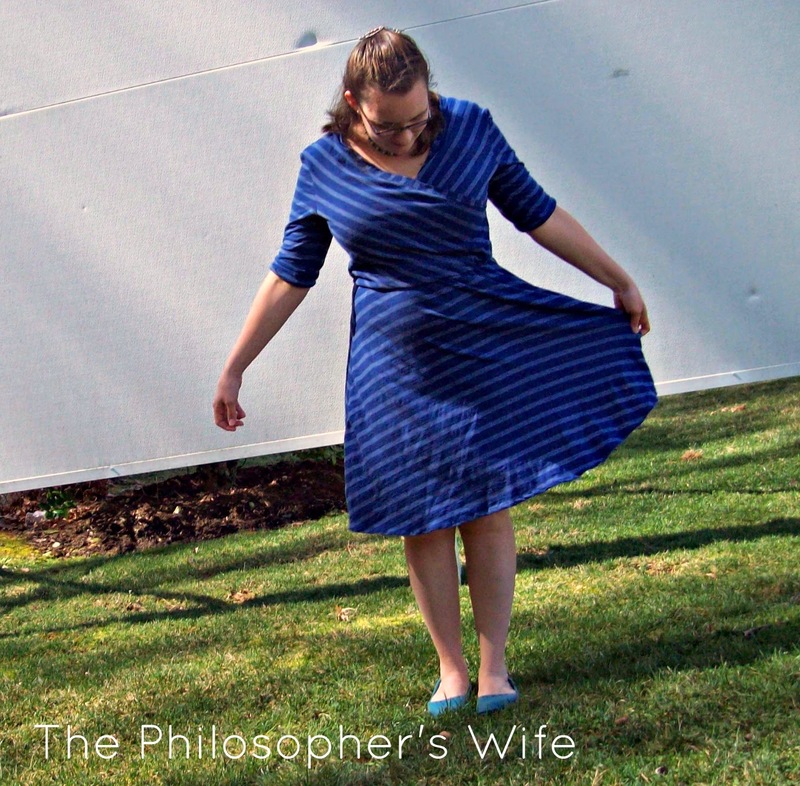 Today I am sharing the Blue Stripes Dress that I made a couple of weeks ago. This dress was a stretch of my skills. I've only worked with knits once before -- ages ago at a 4-H summer program. And, just for fun, it's a striped fabric. Badly cut strips can look ridiculous. Also stripes that don't match up look sloppy. I am so happy that my stripes (pretty much) match up! I was also excited to discover that my sewing machine had a "honeycomb" stitch just for knits. I have such a terrible time trying to photograph myself, so I had Catherine, age four, take these pictures. How do you think she did? 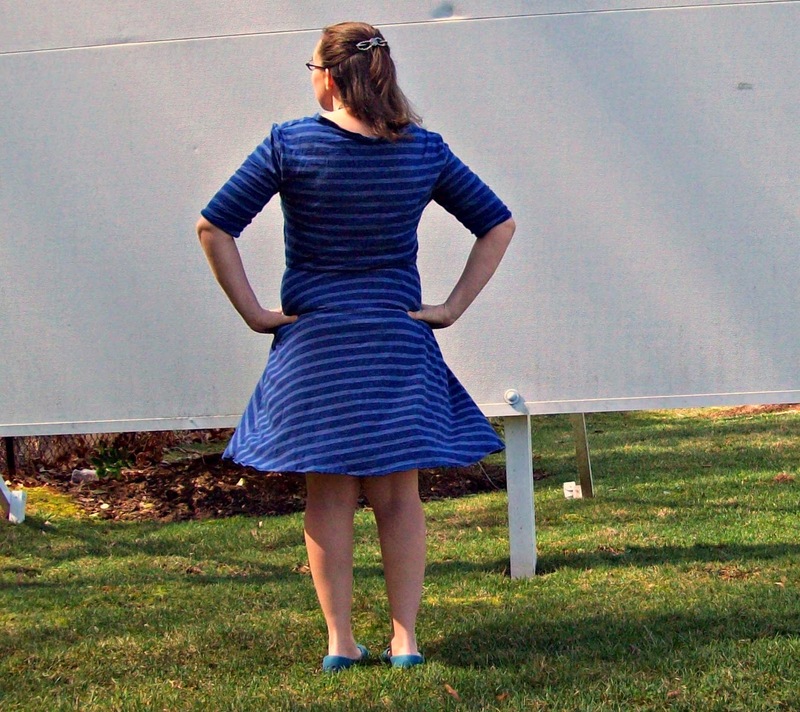 While it was a delightfully warm spring-like day it was quite windy while we were attempting our photo session. I have the sewing bug again! I am going to attempt Mother and Daughter Easter dresses. (Which I need to get started right away!) We shall see what new skills those bring! Thank you so much for visiting! 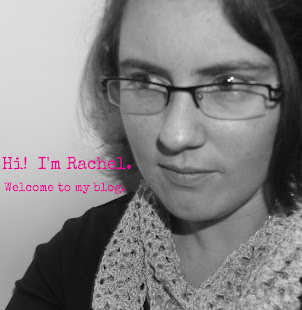 I'd love to have you follow me by email or Bloglovin'. 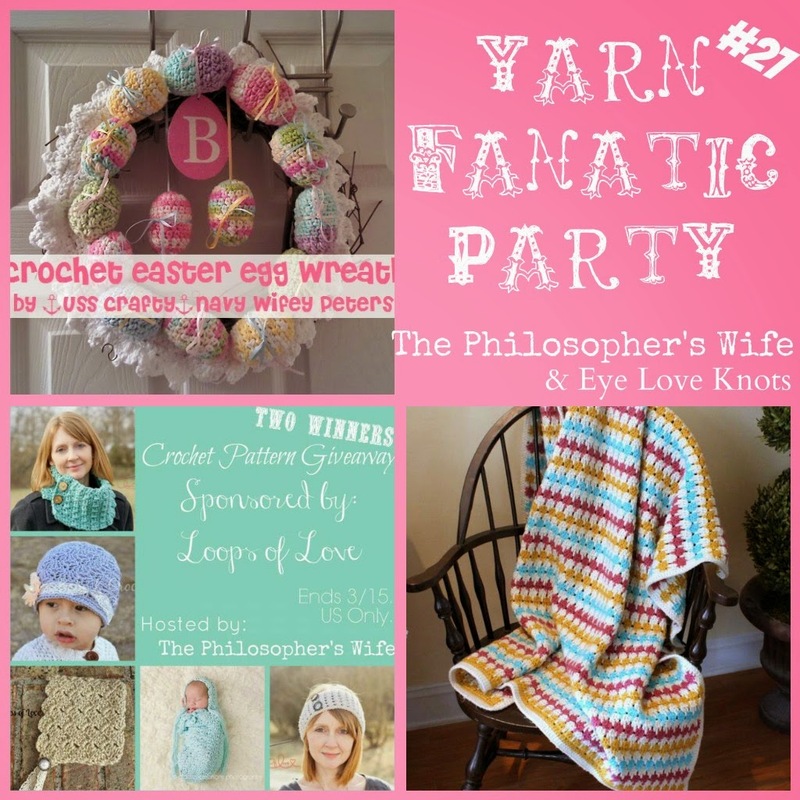 Welcome to the twenty-eighth Yarn Fanatic Party! St. Patrick's Day is March 17th, so it's the perfect time to whip up a few of these cute little shamrocks by Midwestern Moms. Today's giveaway is sponsored by The Hook Hound. Carlinda has many beautiful crochet patterns for sale in her shop.Personally, I love the owl patterns that she sells. 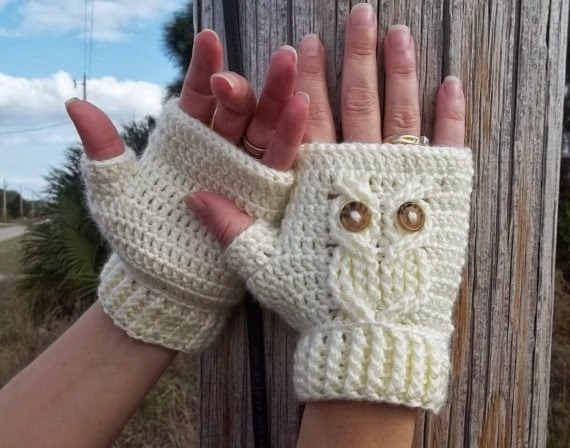 I'm super excited that one lucky winner will receive the crochet pattern for these It's a Hoot Owl Texting Gloves. Aren't they adorable? 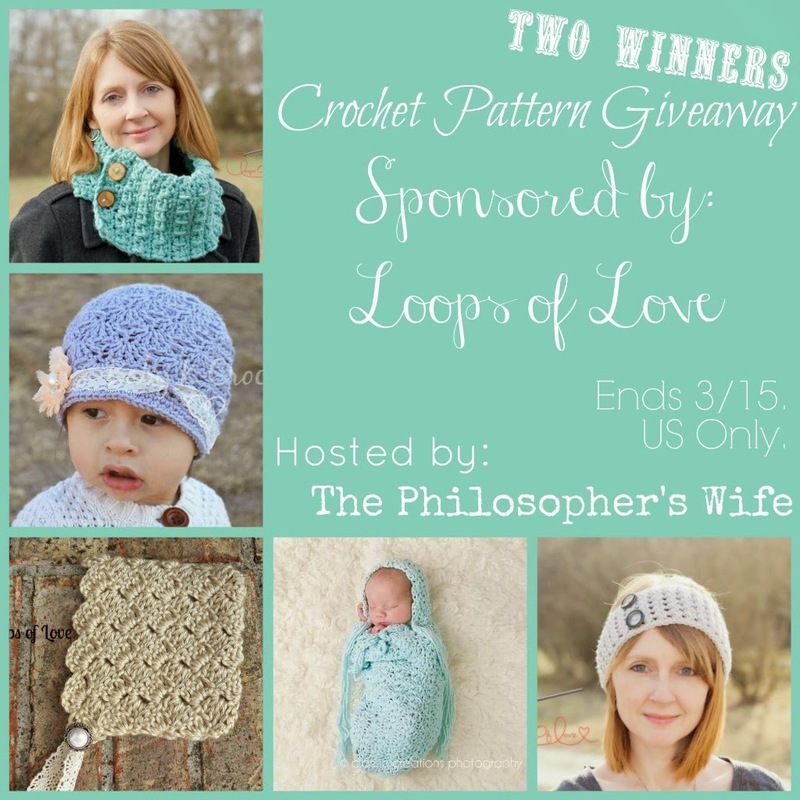 A second winner will be able to choose one pattern from the shop. That's right -- TWO WINNERS! Details and Important Information: Must be 18+ to enter. US only. Void where prohibited. Winner must respond to my email within 48 hours or a new winner will be chosen. Social media is not affiliated with this giveaway. The Hook Hound is responsible for prize fulfillment. This giveaway is now over. 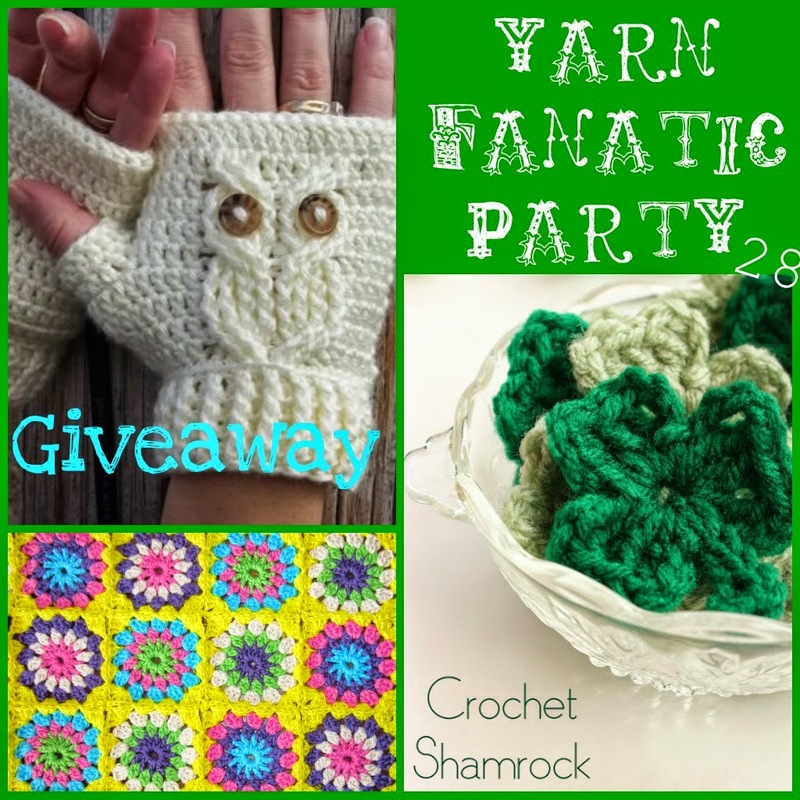 Make sure to check out the newest Yarn Fanatic Party for another great giveaway! Just an FYI: If you buy something from Amazon after clicking through one of my affiliate links I will receive a small commission. It doesn't cost you anything extra, but it does give me a few extra pennies. I really do greatly appreciate your support! 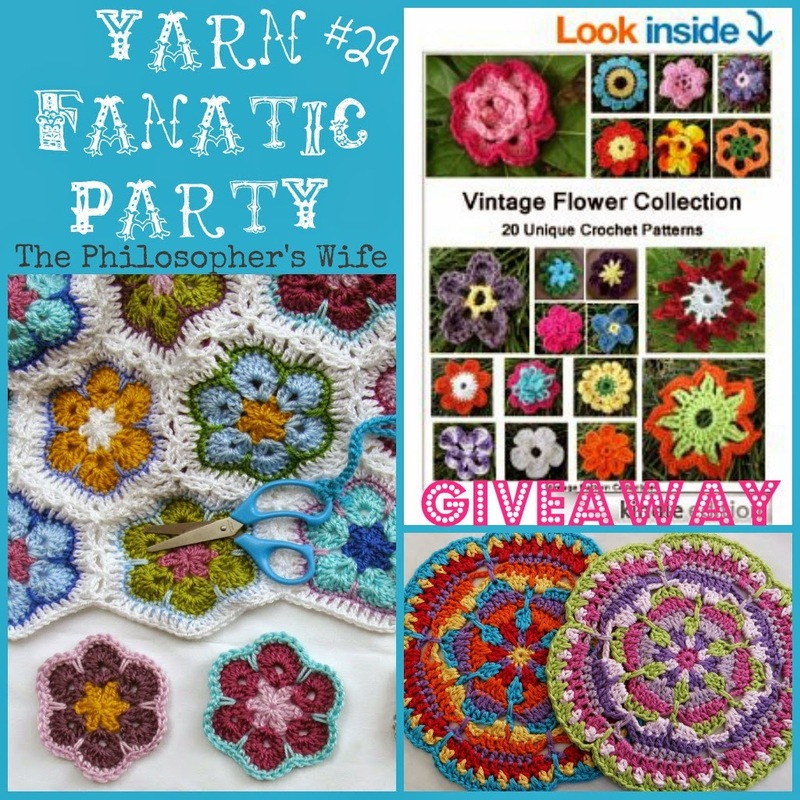 It's time for the twenty-seventh Yarn Fanatic Party! I can't believe that Easter is already right around the corner! (I am still planning on sewing matching dresses for Catherine and me, I better get started!) 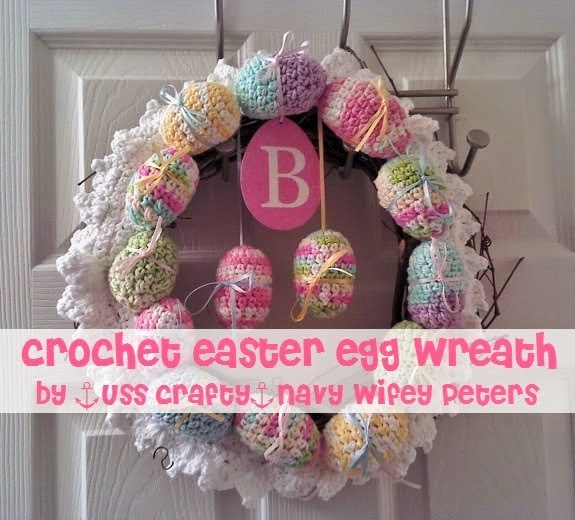 This wreath by Navy Wifey Peters Aboard USS Crafty is too cute! 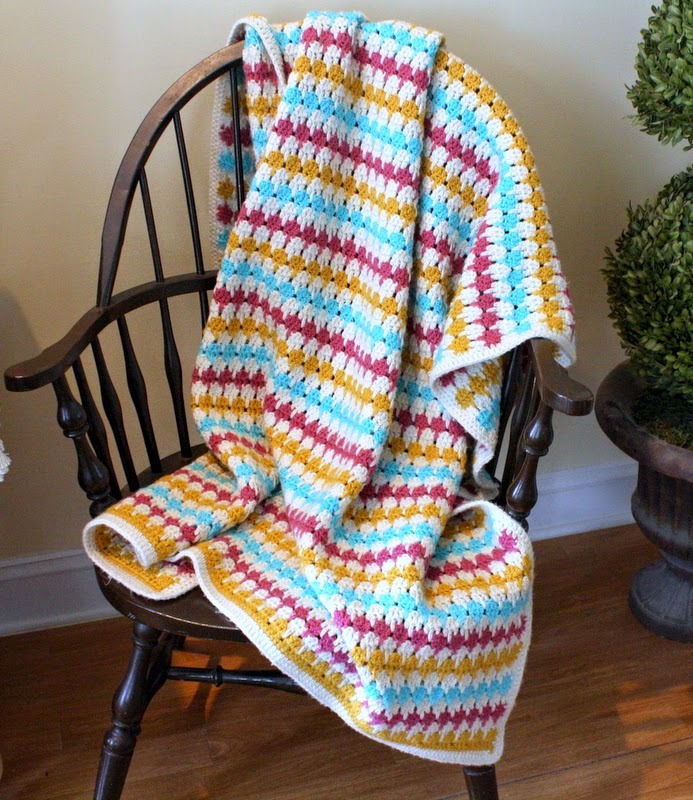 I also love this Larksfoot Afghan Pattern. The pattern is unique, and Kate gives an easy to follow tutorial. 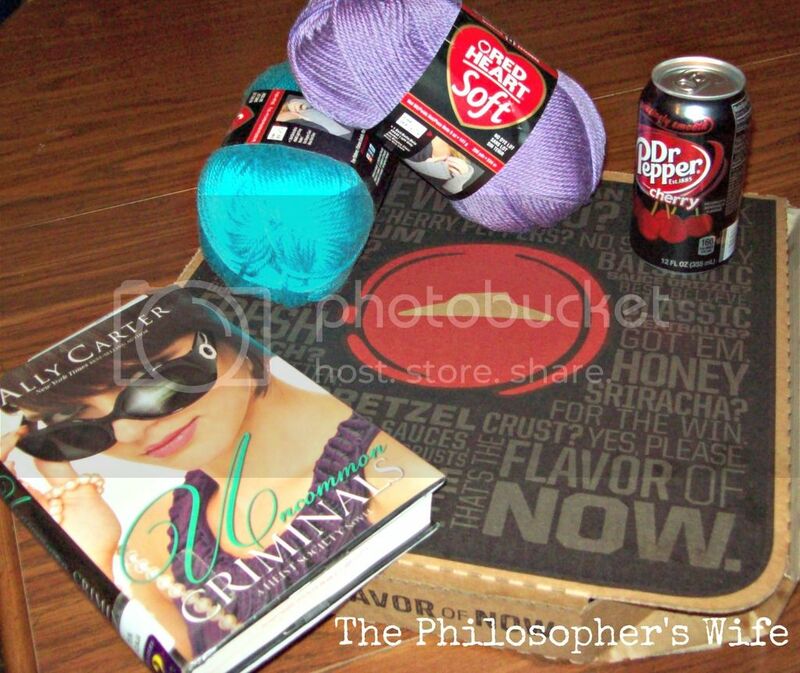 Today's giveaway is sponsored by Loops of Love. Lisa specializes in crochet patterns. 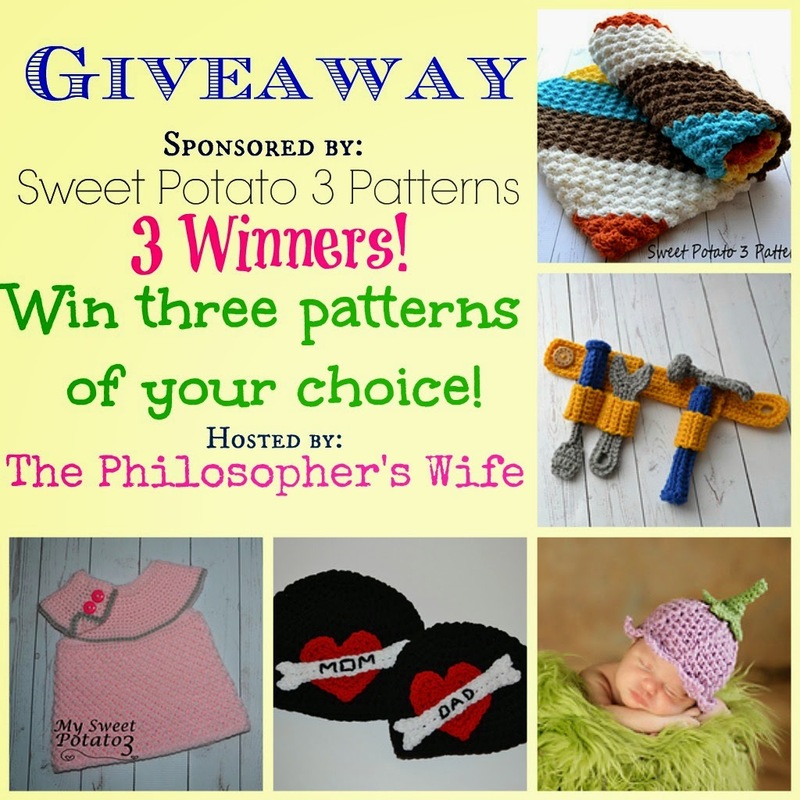 Today she is generously giving away two patterns to two lucky readers! Some of my favorite patterns of hers include the Elise Cowl, the Cora Couture Baby Bonnet, and the Karys Cloche. Details and Important Information: Must be 18+ to enter. US only. Void where prohibited. Winner must respond to my email within 48 hours or a new winner will be chosen. Social media is not affiliated with this giveaway. Loops of Love is responsible for prize fulfillment. Simply 7 was created because they were tired of seeing products in grocery stores made with ingredients that us consumers couldn't even pronounce. They decided to create a company that makes sure that every ingredient in their products is not only natural, but is SIMPLE. They also wanted to show people that simple ingredients are actually exceptionally delicious. 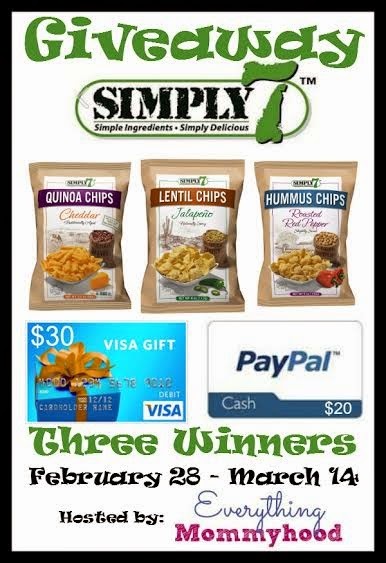 They have 3 different products available - Quinoa chips, hummus chips, and lentil chips. Quinoa Chips are simply delicious, light, crunchy snacks that have 8-9 grams of protein per serving. Quinoa Chips come in Sea Salt, Barbecue, Cheddar, & Sour Cream and Onion. Hummus Chips are creamy, authentic hummus flavor with 50% less fat than potato chips. Hummus Chips come in Sea Salt, Roasted Red Pepper, Spicy Chili Pepper, & Tomato Basil. Lentil chips are a natural lentil flavor with 40% less fat than potato chips. Lentil Chips come in Sea Salt, Creamy Dill, Jalapeno, & Bruschetta. February is Heart Month, and while it's the end of February, we wanted to finish it off with a great product! You can make great choices when you snack, like Simply7 Snacks! You can purchase Simply7 snacks on their website or at a store near you! While at their website, make sure you check out the Snack Squad and you could get a personalized bag just for you! Details and Fine Print: Open to US Residents, 18 and up only. One entry per household/IP Address. Void where prohibited. Winners will be chosen randomly via the Giveaway Tools entry form and will be emailed. Winners will have 48 hours to claim prize before a new winner(s) is chosen. Giveaway ends 3/14/15 at 11:59pm Eastern. Disclosure: Everything Mommyhood received a case and monetary compensation for the posting of this giveaway. 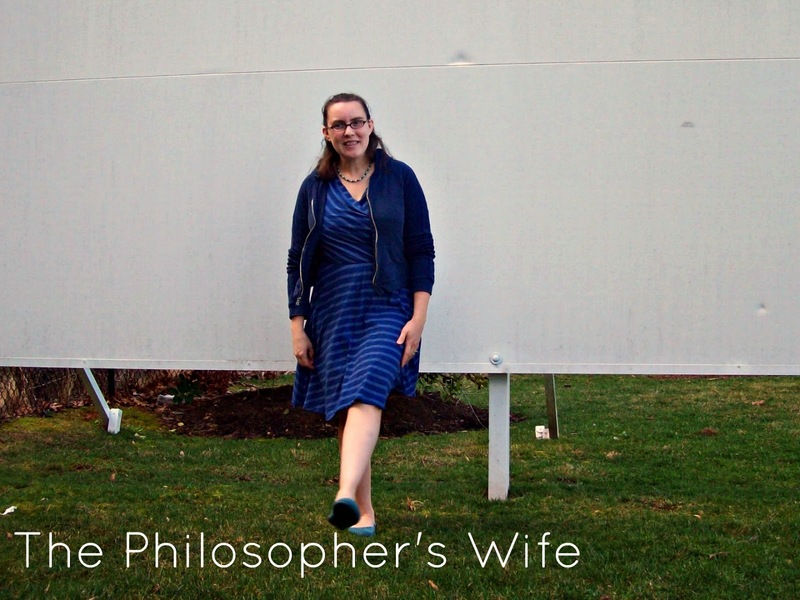 The Philosopher's Wife was not compensated for this posting. All thoughts and opinions are those of our own and were not influenced in any way. Facebook, Twitter, Pinterest, Google, and any other social media are not affiliated with this posting or giveaway. Everything Mommyhood is responsible for the $20 PayPal while Simply7 is responsible for the other prizes. This disclosure is done in accordance with the Federal Trade Commission 10 CFR, Part 255 Guides Concerning the use of Endorsements and Testimonials in Advertising. If you have any questions about this event or would like to see your event hosted by Everything Mommyhood, please email EverythingMommyhood@gmail.com. This is a sponsored post on behalf of Holland America. All opinions are my own. This post may contain affiliate links. It's no secret that food is a big part of a cruise. 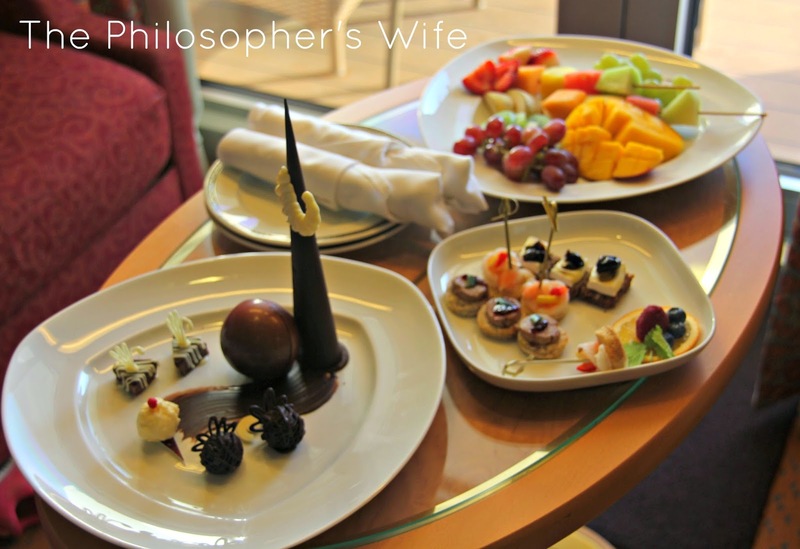 Upon entering our lovely stateroom aboard Holland America's ms Noordam we were greeted with an incredibly appetizing display of "yummyness". 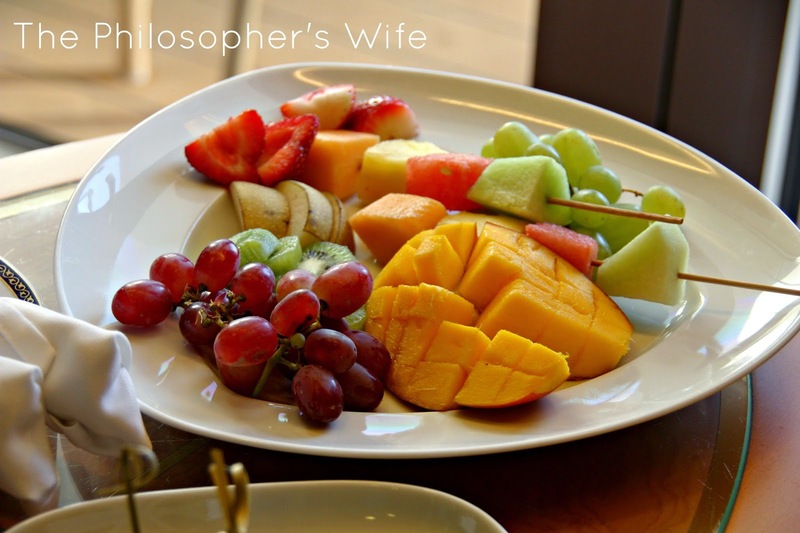 Fresh fruit, shrimp, and chocolate were tantalizingly waiting for us on our table. Catherine and Dominic waited, only somewhat patiently, for me to to take a couple of quick pictures. All of the food was delicious. 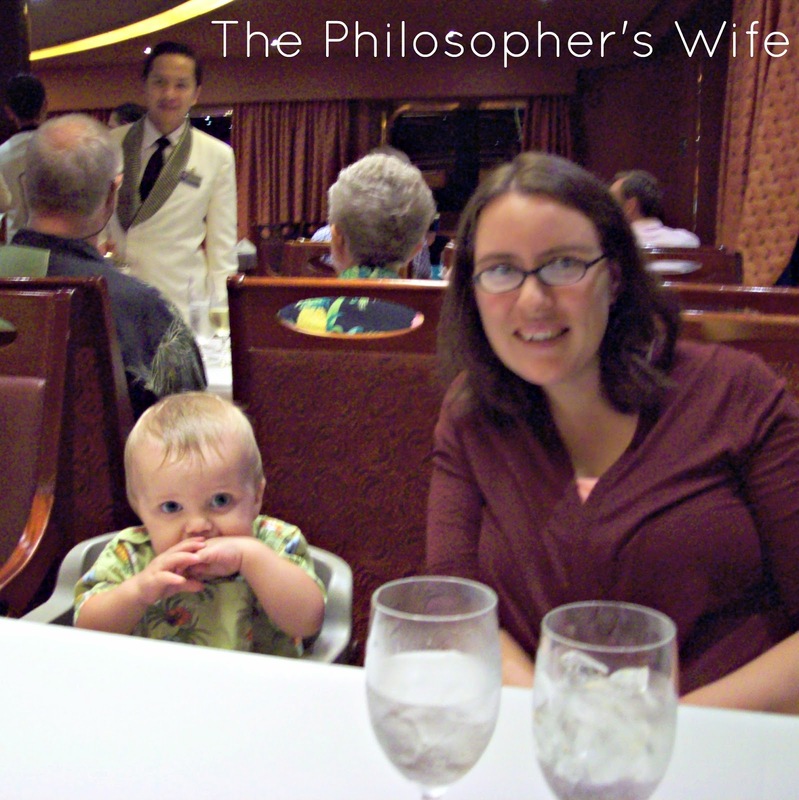 Like I said before in my Quick Review, this was my fifth cruise and I think it was the best food yet. We enjoyed food from the buffet, the main dinning room, poolside, in our room, at The Pinnacle Grill, and at Canaletto. The service everywhere was absolutely impeccable, with notable increase at the more formal choices. The kids loved the dinning room. Catherine loves going to restaurants, despite the fact that she's often too picky to order off the menu, and she simply adored getting dressed up to go to a restaurant every single night. (To be honest, we don't eat out much so it really was exciting for her.) Dominic also enjoyed the dining room. They provided a highchair, which was waiting for us at our table every night. (A bonus of the set dinnertime!) One of my favorite dishes was a soup appetizer, the Butternut and Scallions soup. Dominic shared so much that I had to ask for seconds! Once again, I must rave about the service we received daily in the main dining room. Our server, Doni S., went above and beyond. Catherine still plays with her origami animals that he made daily for her. (They posed together for the below picture.) The maitre d', Robbien F., was always helpful and very attentive. 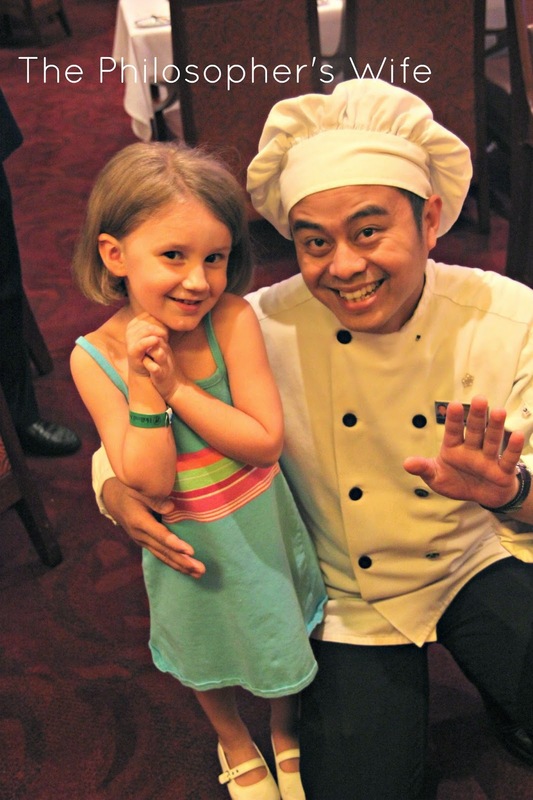 Of course, I can't forget our second waiter, Febi, who was also fantastic. Thank you, guys! 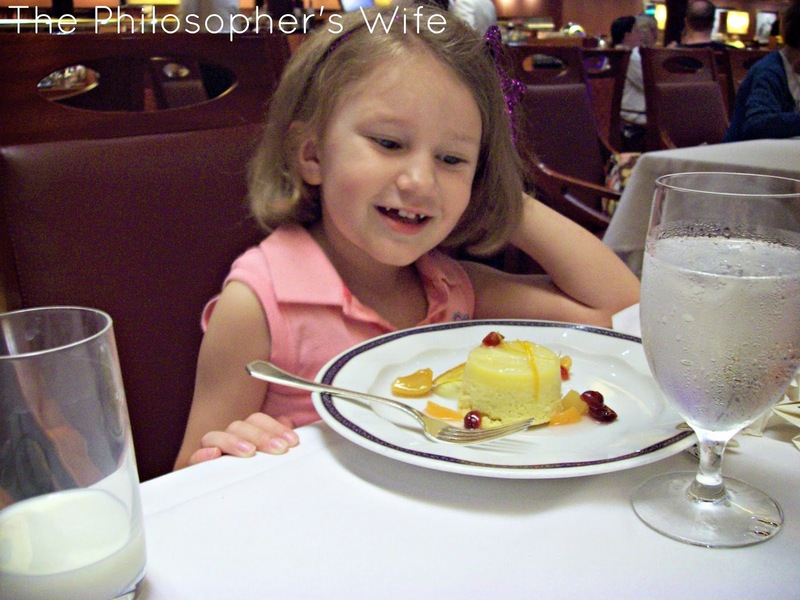 I can't talk about the cruise food without talking about the buffet! They had a large variety of all of the buffet basics and everything was very good. 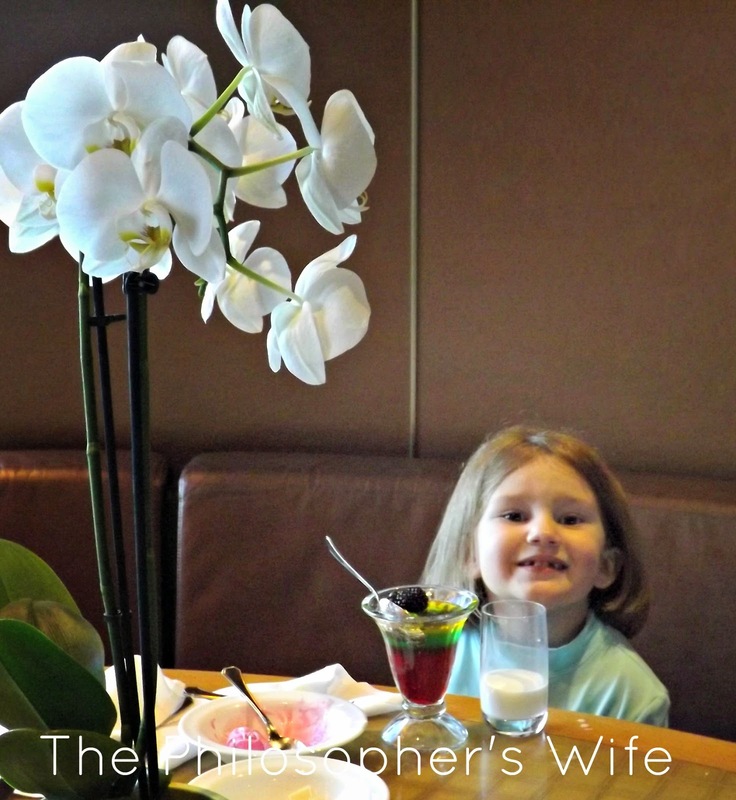 Catherine very much enjoyed the "Jamaican Jello" among the many other goodies. In my humble opinion, while the buffet is good, the service, atmosphere, and food make dining in the main dining room (and the restaurants with a fee) an obvious choice, but I know that many people prefer the more relaxed buffet. 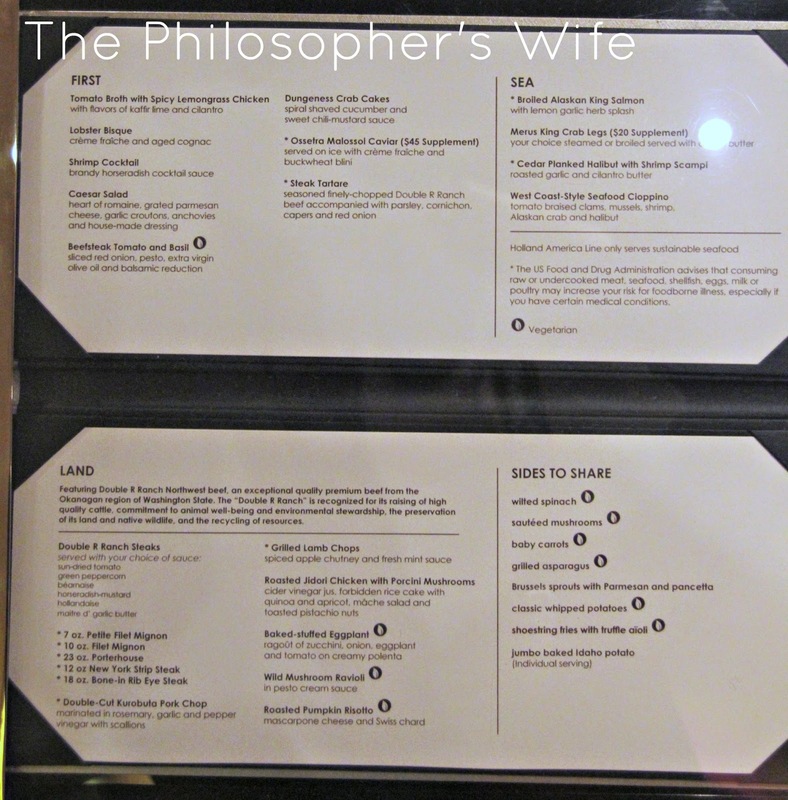 Thanks to Holland America we had the pleasure of dining at The Pinnacle Grill and at the Canaletto Restaurant. There is a $29 per person additional fee to eat at The Pinnacle, but it is more than worth it! It was one of the most delicious meals that I've ever had. Possibly the most delicious. Because I was so busy enjoying good food and company I didn't remember to take a picture until dessert came. 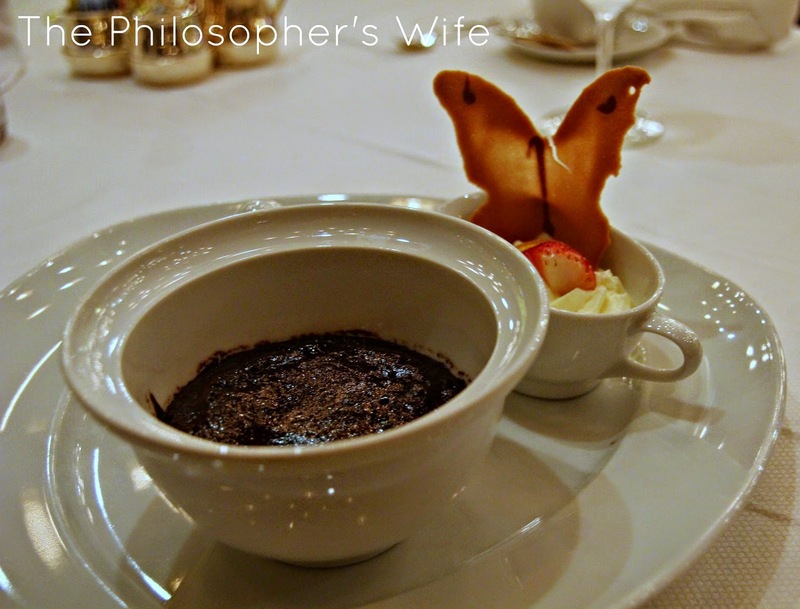 I had this decadent Volcano chocolate cake, which I actually found myself unable to finish because I was so full! The pre-dessert chocolate truffles did me in. So delicious! One last note, the hamburgers at the poolside grill were the best burgers that I've had on a cruise. They are grilled to order, so that makes them even better! Disclaimer: I received a few amenities while on board in exchange for my honest opinions.